Michael Jackson - Simply a Legend! When I hear the name Michael Jackson, I think of brilliance, of dazzling stars, lasers and deep emotions.I think he is one of the finest people to hit this planet, and, in my estimation, he is the true King of Pop, Rock and Soul. Welcome to Michael Jackson World. 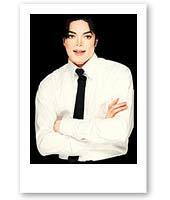 We provide exclusive information, news and pictures all about the King of Pop so feel free to check us out. Show your support for 'My Michael World!' Please tell some friends about this site and place the below banner on your website.